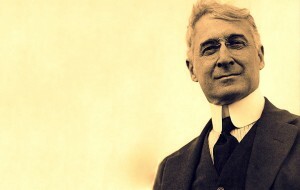 Starting out as a Wall Street office boy, Baruch became wealthy as a stock market speculator and was appointed chairman of the War Industries Board by President Woodrow Wilson during World War I. After the victory, he served as Wilson’s top adviser in negotiating the Treaty of Versailles. Baruch later served President Franklin Roosevelt as an adviser during World War II and was instrumental after that war in formulating United Nations policy regarding the control of atomic energy.